Although the official photos aren’t up yet, there were about 60 photos submitted by various people to the Kilomathon website of the race. I managed to actually find one featuring yours truly, though from a distance and in an unfortunate ‘mid stride’ stance that doesn’t make my running look particularly dynamic. I will have you know that I beat the chick in front of me. I'm the one in black, ahead of the dude in green, behind the chick in the white shirt (for now). On the left: Murrayfield Stadium! 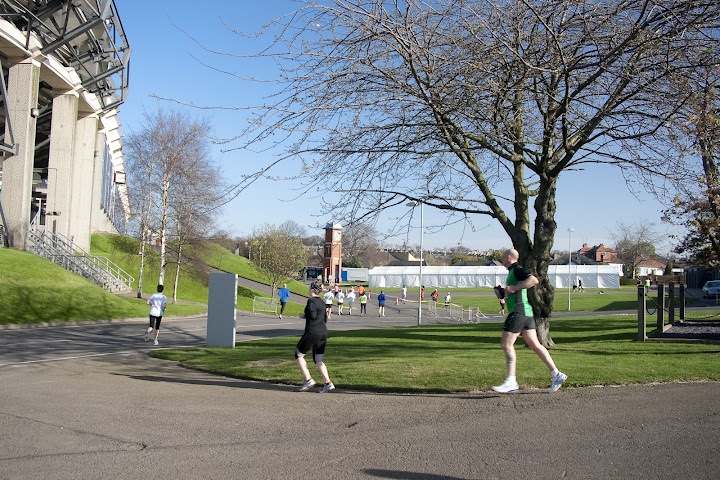 This entry was posted in Edinburgh, Running and tagged Edinburgh, kilomathon, murrayfield stadium, running by MedalSlut. Bookmark the permalink.